Vicky Moses returned to Spitalfields for the first time in over fifty years while house-hunting last October, and had the strange experience of encountering her younger self at the Providence Row Shelter in Crispin St, where she had once stayed as child. 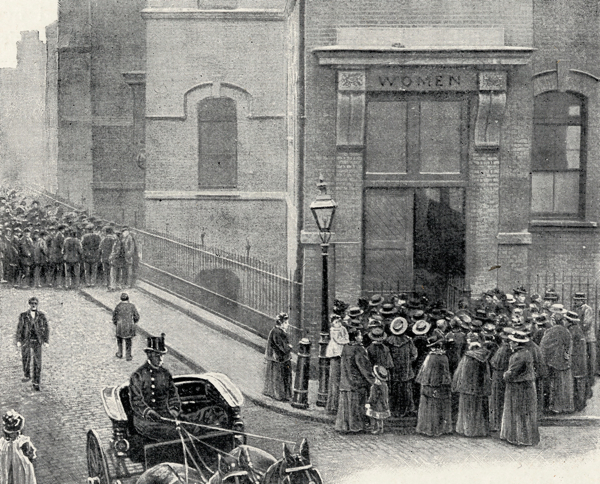 Now Vicky has moved into a flat nearby in the Petticoat Tower and confesses that it is no accident that after all these years she has chosen to make her permanent home in Spitalfields.“The place feels comfortable to me,” she confirmed when I met her in Crispin St outside the former Providence Row Shelter yesterday. “During the winter of 1958, my mother took myself, aged ten, with my sister and brother aged six and four, and a six-month-old baby, to London to get away from my violent father. Arriving at Victoria Station with just the housekeeping money, Mum had no option but to seek help. She went first to what is now The Passage, a charitable hostel in Carlisle Place in Victoria, but there was no help there for a family such as ours. 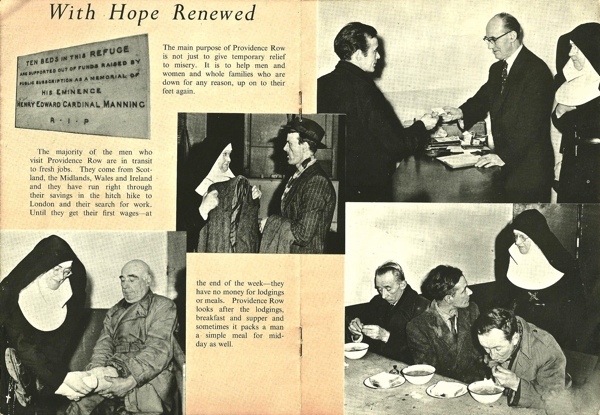 Eventually – having walked right across London looking for somewhere to stay – by that evening we arrived at the doors of Providence Row in Spitalfields where we were given beds and this became our temporary home. As a ten-year-old, I was able to take it all in and remember it well, even now. It was such a contrast to our suburban life, but we were safe and secure and with our mother, our rock. 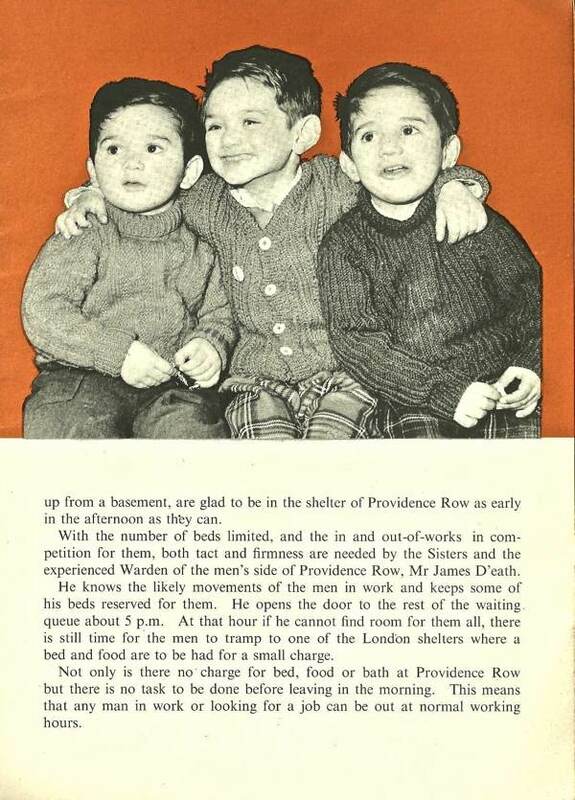 My memories of Providence Row are these – From the street you went up steps to the door, and inside was a long large room with a huge wooden table running through the middle, and, on either side, along the walls, were wooden benches. 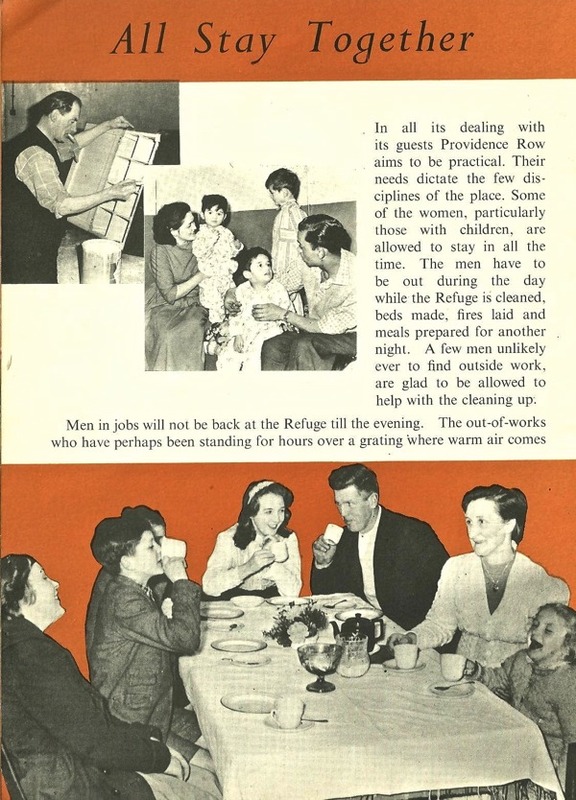 Women and children were separated from the men who were downstairs. Each night, before going to bed, we were given a mug of cocoa and a thick slice of bread and butter. We all went to bed about the same time. The dormitory had beds arranged, hospital-style, around the walls, facing into the room, and a double row ran down the centre. We were in the women’s dormitory, my sister and I sharing a single bed, Mum sleeping with my brother with the baby in-between. In the bed next to ours, an old woman slept fully clothed, muttering and snoring which I found most disturbing. In the mornings, we went down for breakfast – a mug of tea and another thick slice of bread and butter. Then we had to go out as the refuge was closed during the day, so there was nothing to do but walk the streets. Mum took this opportunity to show us the sights of London that were within walking distance. She showed us Billingsgate Fish Market and we went to St Paul’s, to Petticoat Lane Market where the crockery seller enthralled me with his banter and where I first tasted hot chestnuts, and to Fleet St and the Tower of London and Tower Bridge. I remember waiting and then eventually seeing the Bridge open and close for a ship to pass through. There were the bomb sites too, fascinating places for a child. I read ‘An Episode of Sparrows’ by Rumer Godden when I was twelve and I saw the film version ‘Innocent Sinners’. It was all familiar to me because I knew the location, I’d lived there. ‘A Kid for Two Farthings’ was another film I saw not long after our stay – I must watch it again to relive those days, to see it again through my child’s eyes. The days were very long and we had to be fed, which meant food on park benches. And it was cold. But eventually 5pm would come round and we could return to the refuge. We should have been at school, of course, and my eleven-plus exam was approaching. I’d been learning long division of pounds, shillings and pence, so Mum taught me this at the shelter in the evenings. I knelt at the bench with a piece of paper on which Mum had written some sums and next to me were her spare coins to help me. The other residents must have thought this odd, but Mum was not to be deterred, the eleven-plus was important and preparation continued regardless of circumstances. Next to us on the bench, sat another mother with her two daughters, the only other family I can remember. One daughter was my age, and the other was younger. I played with the older girl and we became friends, even though there was nowhere for us to go and play or even talk, other than by sitting beside each other on the bench. The other residents came from an existence very different to mine. 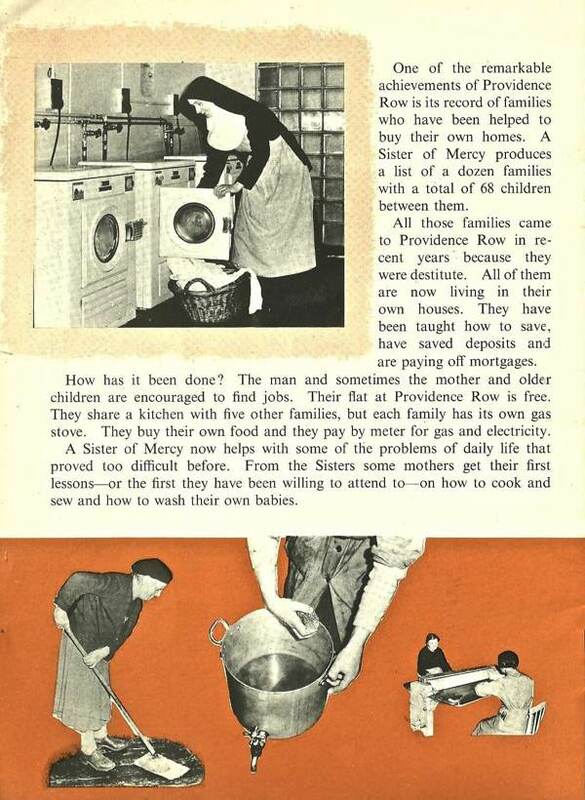 They were poor, desperate people from a Dickensian world – people whose problems were not solved by the new welfare state, but I didn’t feel threatened, and the nuns and lay staff were kind, and our Mum was our star. When the time came for us to leave – we were moving on to stay with my uncle – I remember a nun came to the door to see us off. I can see her standing at the top of the steps. Mum needed to pop back inside to say goodbye to someone, and asked me to hold onto the pram and watch the others. She put her purse under the pram cover and went inside. Five minutes later she reappeared and went for her purse. It had gone. Someone had seen her go and distracted me from my task. Vicky passed her eleven-plus exam in 1959. 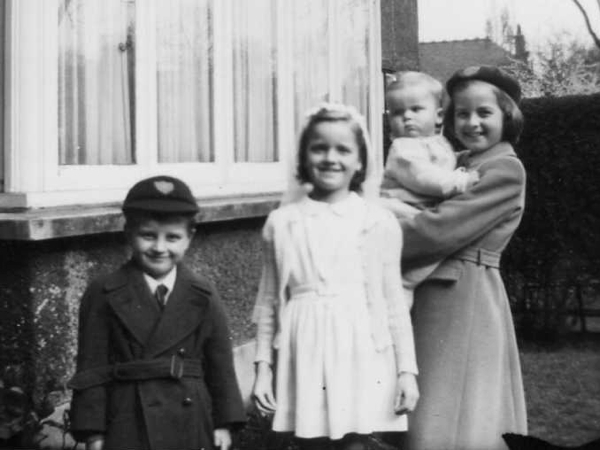 Vicky (far right holding the baby) with her brothers and sisters in the spring of 1959, six months after their stay in the Providence Row Shelter. 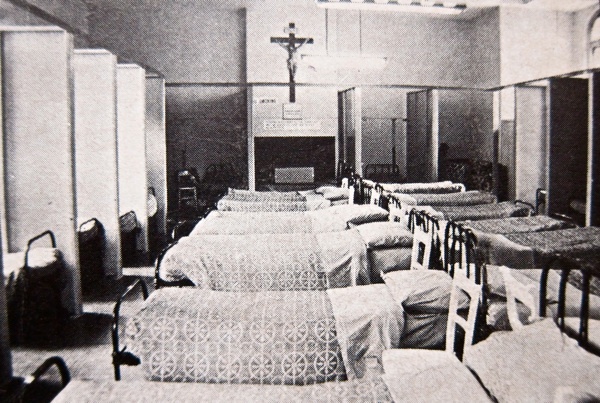 The dormitory – Vicky’s mother and her two youngest children slept in the bed in the foreground, while Vicky and her sister shared the next bed in the front of the picture. 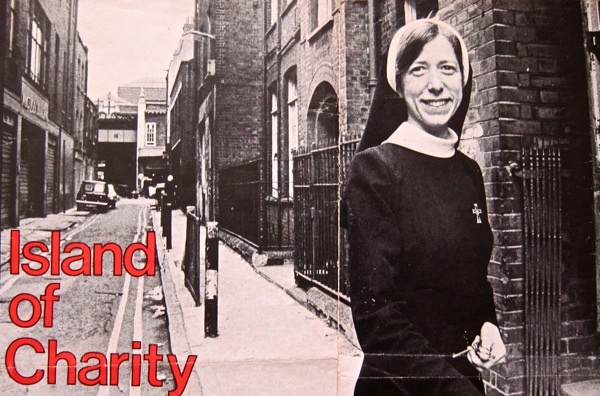 Sister Fidelma outside Providence Row’s Gun St entrance, pictured in Catholic Life, 1976. Vicky stands in Gun St where Sister Fidelma once stood. The shelter seen from the corner of Crispin St and Whites Row, a century ago. 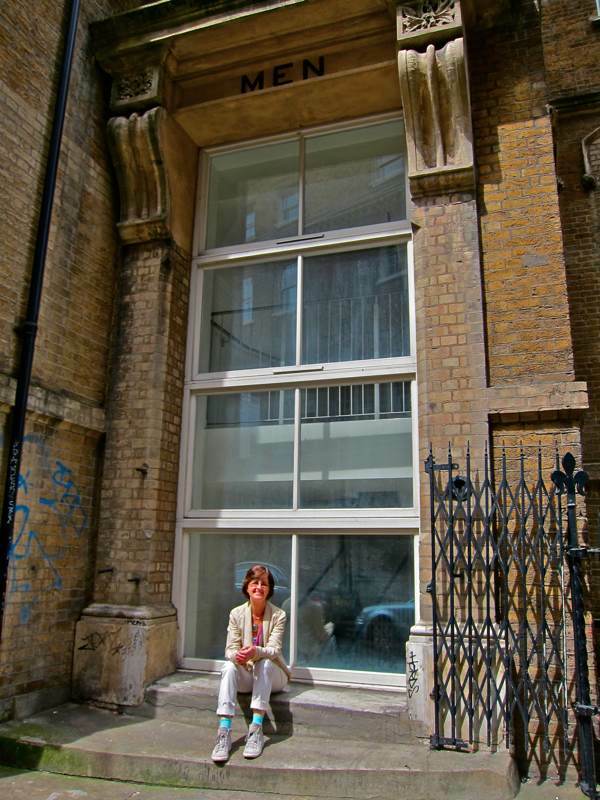 Vicky is now a resident of Spitalfields and the shelter has been converted as student accommodation. 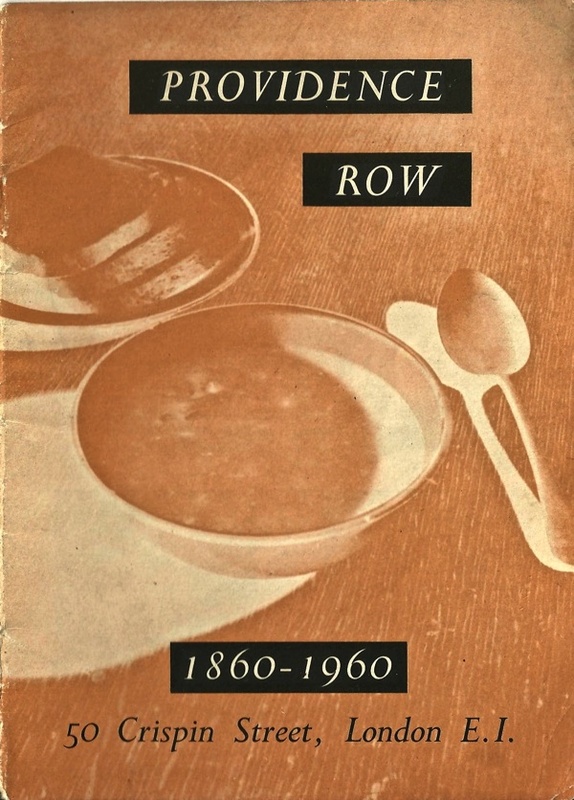 Extracts from a pamphlet produced by Providence Row in 1960. 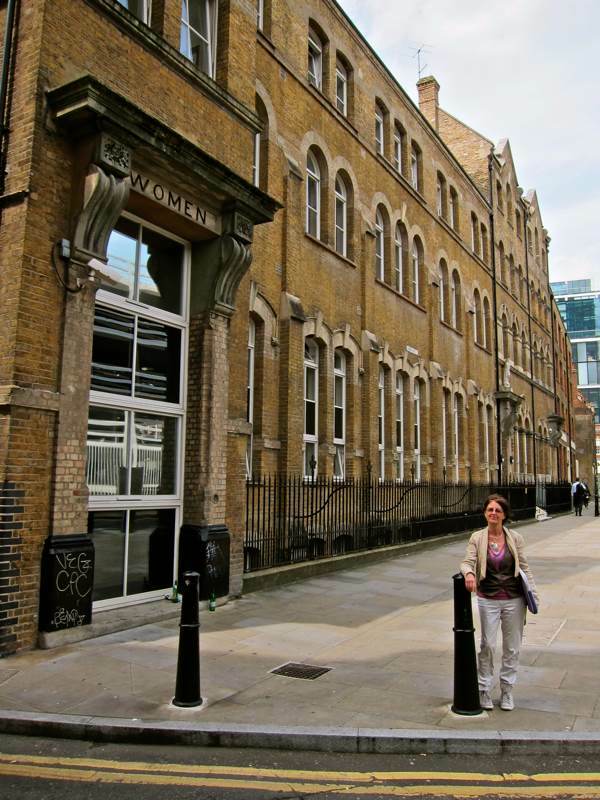 Click here to read about the continuing work of Providence Row in Spitalfields. one of the biggest problems for women fleeing abusive husbands, homelessness, or trying to detox from drug addiction or alcoholism in the US is a lack of accommodation for them and their children. so they stay. this is a wonderful story, i am thrilled to think of vicky and her mother working those sums on the bench. god bless. I think I must be about the same vintage as Vicky. Thankfully I did not come from a broken home and I suppose we lived in relative luxury in a Council flat in Hackney. But many of the memories and views from Vicky are ‘familiar’. I used to work in Barnets washing dishes on a Sunday. What a marvellous mother Vicky had to escape her failed husband and then to help her daughter to pass the 11+. Which I failed. practical help and kindness. Another brilliant everyday story. I shall show this to my class of 10 year olds when they tell me they haven’t done their homework because they were too busy. What an incredible story. I hope Vicky is reading this as we are screening ‘A Kid for Two Farthings’ this sunday (July 1st) at The Brady Arts Centre, 192-196 Hanbury Street, E1. It’s a free screening so if anyone wants to come along and see Petticoat Lane as it used to be please drop by. It’s starting at 12pm. Vicky, if you can make it please come and say hello. How wonderful to see these old pictures especially the one of the entrance in Gun street, which is just as I have remembered it for the last 60 years! My father was caretaker at the refuge and we lived in a flat at the very top of the building, which was accessed by that entrance. We were there until 1952 when I was six and we moved for some reason to live with my uncle in Northamptonshire. 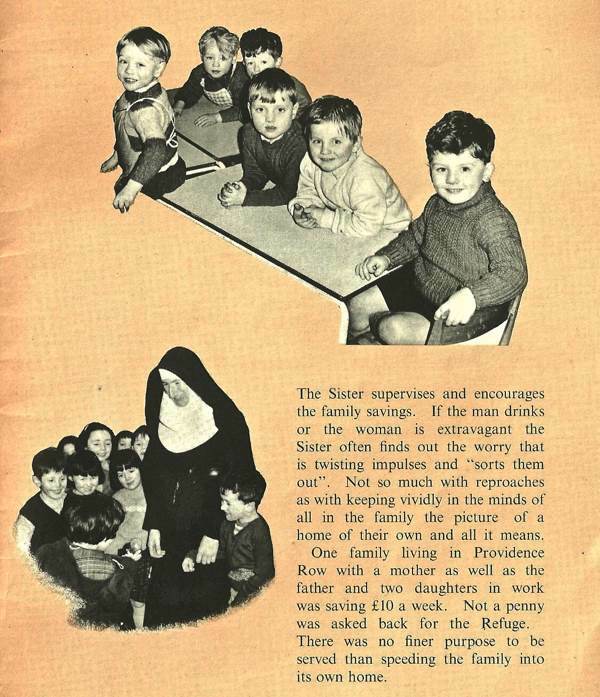 I remember going to the school that the nuns ran from the age of 4 which I think also had the entrance in Gun Street. I wished I had photos from that time, but I only have one of a children’s Christmas party in the big hall, so to see this was just great. My parents were married whilst my father worked there and their wedding photo’s were taken outside the shop opposite on the corner of Gun street. A wonderful post and very moving. Great sense of connection coming through the comments too. Thank you, as always. Well done Vicky, well done Mum. Moving, humbling stuff. What a story to share, Vicky! Good on you. What a great mum, yes indeed, and what a fab big sis you are. Thanks, gentle author . What a strong brave woman your mother was Vicky! 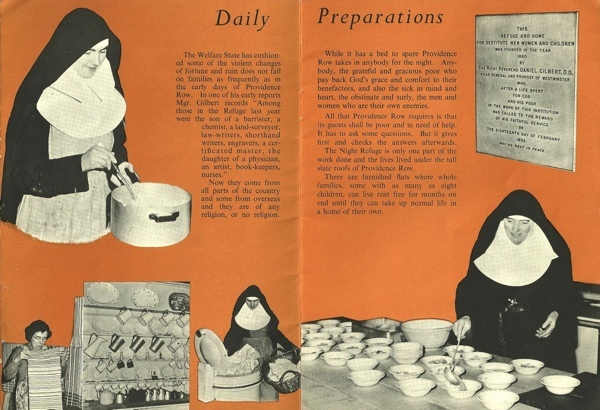 and God bless the nuns for the work they did at this time. I hope your ‘homecoming’ is all you hope. a classic gentle author post , thanks to all involved,(vicky specially) for the inspiration I feel now. This was just so moving and beautiful, with the strength and resilience of women shining through every word. Thank you for this wonderful post. Thanks, Gentle Author, for another moving portrait. And to Vicky, thank you for sharing your beautiful story. What a special and courageous mother! A wonderful journey into the past. WoW What a story Vicky ! As ‘new’ member of the family it is a shocking, moving and astonishing addition to the family history. Obviously it brings a new respect, admiration and compassion for your Mum, but also raises many questions about how she reconciled herself with the future life she has lived. I am proud to be part of the family and am very thankful that my lovely husband was only a little baby and has no memory of what must have been a harrowing time. Thank goodness for Providence House. What a brilliant story. I met Vicky last week at a Friends of City Gardens Event. 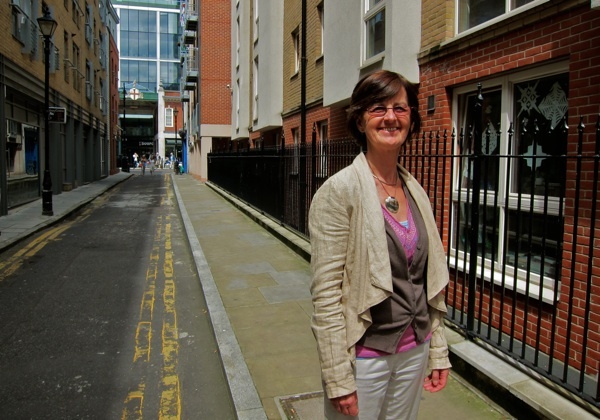 I’m the CEO at Providence Row and I love hearing stories about the charity’s past. We are at 82 Wentworth Street now – there’s an event on 6th August (kind of an open evening) called Dellow Nights if anyone wants to see what we look like in 2015!